I finished pinning all the ornaments last night. I just have to sew back to front, turn and stuff and sew up the opening and I'm done. It's been a great fun project. I can elevate my feet and knees while doing it, or multi-task or watch TV or a movie. I ran out of the braid I was using to make the hangers so I rummaged in the box (the contents of which are mostly on the table in the office since Pilchard sleeps in the box) for something else. I found this rickrack. This is old. This was from Great Aunt Adele's collection. I looked on the back of the wrapper for a copyright date and there isn't one. It's the right color so I used it to finish up the hangers for the ornaments left. 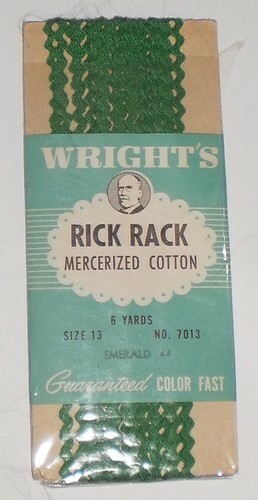 A brief internet search didn't turn up any comparable labels to get an idea of how long this rickrack has been around. I'm guessing at least the 1960's. It is in exceptionally good condition, too. Now that this project is done, I can negotiate with the cat for the use of the box. I got her a new box but she wants to be near me when I'm in the office so I may have to look for another box for the office. The things we do for the comfort of the cats.